Much as my favourite genre of theatres is old-school musicals, my favourite type of film is a lavish costume drama, especially and since I’m nicely ensconced at my parents’ house with their flash new television, I’m going to blog a few of them. 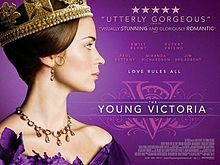 First up is The Young Victoria, the 2009 film detailing the early years of the reign of Queen Victoria and the beginnings of her grand romance with Albert. I have a serious girl crush on Emily Blunt, she was the highlight of The Devil Wears Prada for me but I really fell in love with her whilst watching the bloopers from the film, she has the kind of irresistible laugh I could listen to all day but I do think she is becoming a really interesting actor (who someone should get on the stage!). Written by Julian Fellowes, directed by Jean-Marc Vallée and including producers like Martin Scorsese and Sarah Ferguson – a major force behind getting it made apparently – the film starts off with Victoria as heir presumptive to her uncle King William IV and trying to fend off the avaricious advances of her mother the Duchess of Kent and the hugely ambitious comptroller of her household Sir John Conroy. Matters are complicated by her other uncle, King Leopold of Belgium, who wants to use his family connections to build a British/Belgian alliance, but his decision to use his nephew to seduce his way into her affections has unexpected repercussions for everyone, as the nephew is Prince Albert of Saxe-Coburg-Saalfeld. The film really works because it eschews the rattling through history that often marks period dramas and instead focuses on Victoria as a young woman, struggling to maintain her independence whilst in a position that means she can little, and in the gorgeous depiction of the budding friendship and romance that grows between her and the kindred spirit that she finds in Albert. This is the linchpin of the film and Blunt, and Rupert Friend as Albert, are just stunning together as the initial skirmishes turn into a great fondness and then something immeasurably deep, as he provides her with a companionship, a support from a contemporary that she’d been lacking in her life thus far. Much of their contact was through letters, so a little historical licence has been allowed here to allow a few more meetings, and the film doesn’t shy away from the challenges Albert faced in connecting with a more powerful woman – he could not propose but instead had to wait to be proposed to – and in the early years of their marriage, a great balancing act was necessary and there’s such palpable chemistry between Blunt and Friend that it is agony when they are quarrelling. But there’s a sumptuousness to the whole production that makes it all entirely seductive, not just the leading couple. The connections of Sarah Ferguson meant a shoot in England was possible, using several actual locations and lending a sense of authenticity; Sandy Powell’s Oscar-winning costumes are an astounding visual treat; and there’s an ensemble cast of mouth-watering talent. Miranda Richardson’s cold Germanic mother has a thrillingly frosty relationship with Blunt’s Victoria, difficult to watch at times yet utterly compelling; Harriet Walter is a fount of clever advice as Queen Adelaide; and Rachael Stirling has great fun as the Duchess of Sutherland, a new companion for the Queen – indeed the banquet that features these three heavily is a masterclass in subtle glances and muttered words. Jim Broadbent’s irascible William IV is a triumph as he witnesses the machinations around him that try to move the succession out of his hands, and there’s also strong support from Paul Bettany as Lord Melbourne, out to secure his political future but also coming to slowly respect his sovereign and from Mark Strong as the devious Conroy who will stop at nothing to gain influence in court. There’s even the tiniest of cameos from the human comma himself Tom Brooke as a rabble-rouser in the street. So a gorgeously affecting story, coupled with the most engaging of performances from Emily Blunt (that laugh!) and Rupert Friends, and a production of luxurious quality around them, makes The Young Victoria a lovely film that I really enjoyed watching again. It really benefits from avoiding being too much of a historical biopic and instead becomes an impossibly romantic film that should leave many wishing for a Prince Albert in their lives too.